When you’re learning to play guitar you need to practice chords, strumming patterns, fingerpicking patterns, songs and scales in order to become an an accomplished guitar player. That stuff can be hard sometimes so it’s obvious you also need a break now and then. Indulging in some easy awesome guitar riffs is good for your spirit. It’s motivating and will keep the fun alive while working on your regular practice workout. It’s time to plug into your overdrive and distortion pedals, turn on the amp and just go for it. Here are some of the most easy and timeless guitar riffs and intros that will make you sound like a badass! Click on the song title to watch the video. Click on “Tabs” to see the tablature and click “More Tabs” to find more of the original tablature and artist. Do you know some really easy guitar riffs? Please share in the comments. 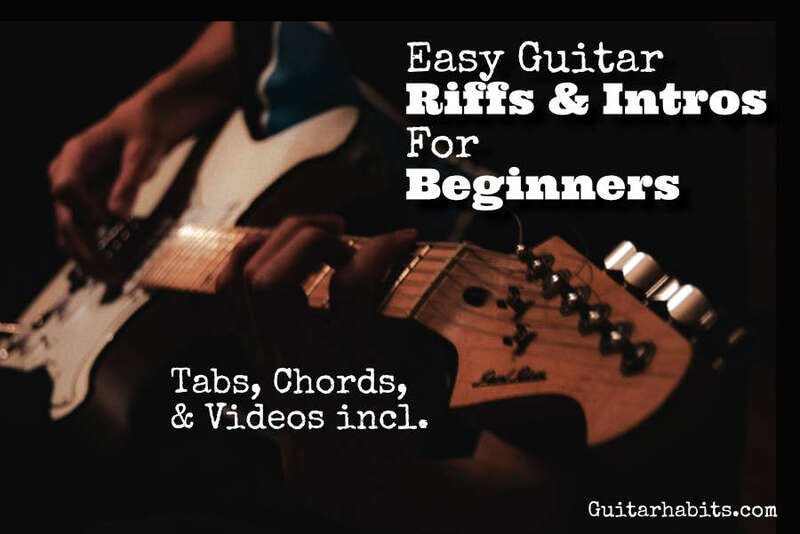 I always wanted to learn easy riffs and intros.The tabulature is easy to learn.My favourite riffs are heart of gold ,the one i love and sunshine of your love.Thanks for sharing. Thanks for mentioning. I appreciate that. I just put up another link for “Heartbreaker”. And thanks for reading Guitarhabits! Those 2 songs are easy to play. You can pick them up fast and sound like a rockstar in like 10 minutes. Fun to play along too.